La Poste is supporting apprenticeships, helping students succeed and become more independent, and preparing them for careers in tomorrow's job market. 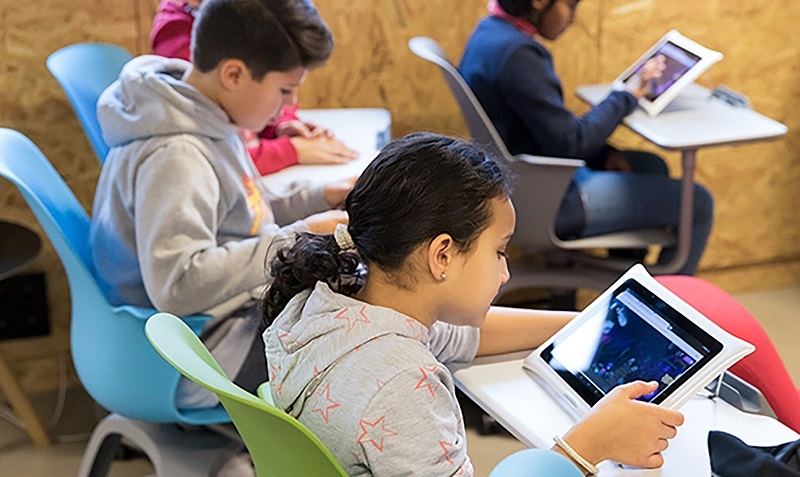 Since June 2018, the town of Cluis (Indre) has provided its school with 12 Sqool tablets from La Poste. Digital technology is becoming a larger and larger part of the classroom environment. Cluis, in the Indre Département, made the choice to use Sqool tablets, designed and manufactured by the French company Unowhy, and distributed by La Poste. Mayor Claude Minet explained this choice: “When La Poste approached me to discuss their new services, I was surprised by the wide range of what they were offering: meal delivery, addressing services, and more. They came to see me at just the right moment, because we were already thinking about buying tablets for our school. I liked that La Poste's offering was comprehensive and easy to use, including delivery, onboarding, maintenance, etc. We appreciated the peace of mind it provided as well as its affordability. The offer included a wide range of applications that were suitable for different age levels. This adaptability was important for us. All in all, they offered us a well thought out and comprehensive deal.” Sqool tablets provide access to applications and dedicated resources that support traditional learning, as well as management tools. Since June 2018, nursery and primary school students have been making the most of this new learning tool. For Marion Krumula, principal of the Cluis school: “Using tablets in our classes has confirmed what we already knew through observation: students learn better with technology. Tablets are fun and interactive. The children pick up on new ideas faster and are learning without feeling like they're doing work. We’re also able to work with each child's individual needs. For example, we use the tablets to help students that are falling behind, or instead of using the projector. Students pick things up at different speeds. The tablets allow them to learn at their own pace, helping avoid moments of frustration. Those that are already doing well can advance further while those who are struggling also feel like they're making progress.” La Poste employees provide installation, onboarding, and maintenance services throughout the equipment's lifecycle. At the end of 2017, UNICEF published a report on children in the digital world. This report highlighted the opportunities provided by internet access and the importance of access to digital technology as a tool in the fight against inequality. It also discussed the risks of such technology and the need for measures to support students and prevent misuse. The school also tackled this issue, beginning with the idea that a mastery of digital technology skills is essential for students to use digital tools reasonably and responsibly, leading eventually to successful insertion into the professional world.